In this month’s newsletter I am pleased to share with you our 2013 Annual Report. Within the last year we have increased collaboration with governments, expanded pedestrian safety work, and brought helmet safety to more schools than ever before. Please read the Annual Report here to find out what we have accomplished. Promotional poster for the nationwide photo competition. 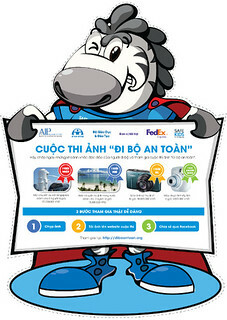 AIP Foundation (Safe Kids Vietnam) in partnership with FedEx, and in cooperation with the National Traffic Safety Committee and Ministry of Education and Training, launched a nationwide photography competition with the aim to promote and gain high school students’ viewpoints of pedestrian safety. Launched on March 5, the competition will run until May 25 and is expected to attract 7,000 high school students from across the country. The competition will require students to capture safe pedestrian behaviors and road risks through photography. When registering, students are required to review an online safety pedestrian guideline which will generate further awareness for themselves helping them become safer pedestrians. FedEx volunteers will screen the photo submissions and join the panel of judges that will select the winning photographs. The program will conclude with an award ceremony in Ho Chi Minh City on May 29 where the winning entries will also be showcased in a photo exhibition. To visit the competition website (in Vietnamese) click here. 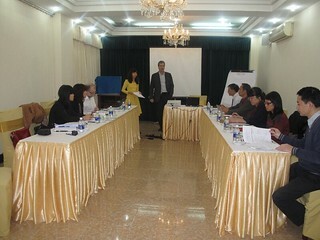 Road safety stakeholders attend GRSP’s child helmet use workshop in Hanoi. AIP Foundation representatives attended two workshops on child helmet use and helmet quality organized by the Global Road Safety Partnership (GRSP) Vietnam on March 12-13 and 14. Facilitated by Bloomberg Philanthropies Advocacy Incubator Advisor and GRSP Grant Programme Manager, and attended by representatives from the World Health Organization, VIJUSAP, Vietnam Red Cross, and AIP Foundation, participants brainstormed solutions to advocate for enforcement of child helmet regulation across the country. On March 14, AIP Foundation representatives also took part and contributed to the second workshop which focused on advocacy issues relating to helmet quality. Both workshops were very constructive and resulted in commitment from all stakeholders to follow-up on specific and actionable items. In response to the workshop and in order to increase child helmet use rates nationwide, AIP Foundation has developed an action plan to continue advocacy and targeted interventions in 2014 and beyond. The high-speed motorcycle exhibition displayed at Phu My Hung. This month, AIP Foundation collaborated with the Ho Chi Minh Traffic Safety Committee, Phu My Hung Development Co., Ltd., and Y&R Vietnam to organize an innovative communication campaign to expose the dangers of high-speed motorcycle riding among youths. The exhibition involved three large shipping containers stacked on top of each other providing a surface area of 35m2. 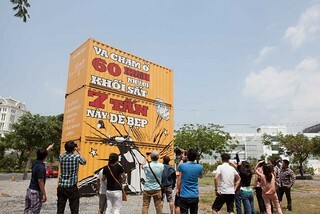 The message, “Crashing at 60km/h is equivalent to being crushed by 7 tons of containers.” was superimposed on the huge container background providing a bold and effective visual. The display was exhibited on the weekend of March 14-16 at Ban Nguyet Lake residential zone, Phu My Hung, in Ho Chi Minh City. The exhibition is the first of such a large public display to be set up in Vietnam, it is hoped that this new and creative approach will bring maximum impact to the target audience - our youth. 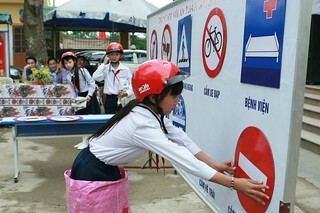 A student participates in informative road safety activities. As part of the Helmets for Kids program, AIP Foundation organized an event called “Fun with Traffic Safety” at two schools in Hai Duong on March 25-26. The event involved extracurricular activities hosted at Cam Thuong Primary School sponsored by Sealed Air, and Ai Quoc Primary School in Hai Duong sponsored by ARRB Group. The two events were attended by 1,414 primary school students, teachers, parents, and representatives from Hai Duong Department of Education and Training, Hai Duong Traffic Safety Committee, and local authorities such as the People’s Committee and Youth Union. At the events, students learned important road safety lessons through fun and interactive activities including traffic simulation games, traffic sign identification games, and helmet painting. The students were also taught the three steps of correct helmet use through informative and entertaining performances. Alvin Yap, Finance Director of Abbott Laboratories presenting at the stakeholder orientation workshop. Helmets for Families, a new road safety education project, sponsored by the global healthcare company Abbott Laboratories, and based on AIP Foundation’s proven school-based program Helmets for Kids, launched in Ho Chi Minh City on March 28. 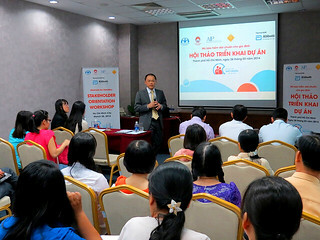 The project commenced with a stakeholder orientation workshop attended by Alvin Yap, Finance Director of Abbott Laboratories, government partners, including the National Traffic Safety Committee, Ministry of Education and Training, Ho Chi Minh Traffic Safety Committee and Department of Education and Training, local authorities, traffic police, and project school principals and teachers. All participants are collaborating on the new project to raise awareness around the safety benefits of helmets that meet the national standard. By partnering with road safety stakeholders and donating free helmets, as well as offering parents subsidized standard helmets in exchange for their low quality helmets, Abbott Laboratories and AIP Foundation hope to change behavior among students and parents and increase standard helmet wearing rates. 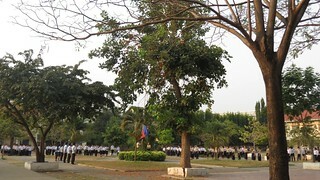 A Road safety assembly held at Wat Phnom High School. On March 3, AIP Foundation organized road safety assemblies at two high schools in Phnom Penh. The road safety education assemblies sponsored by Chevron, were attended by a total of 2,500 students, encouraging them to retain road safety messages, particularly about helmet use and share the message with their family and friends. Students and school management were enthusiastic to participate in these road safety activities, requesting for more activities to further inspire students to practice safe road behaviors and respect traffic laws. Since road safety activities have been implemented in the project schools, no crashes have occurred. A mother shares her road safety concerns during the "My Mom and Helmet Use" forum. 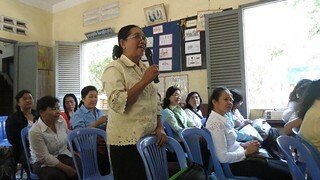 In support of International Women’s Day, a “My Mom and Helmet Use” forum sponsored by Manulife (Cambodia) Plc was held at Wat Preah Put Primary School in Phnom Penh. During the forum, 60 mothers were educated around the topic of road crashes related to helmet use, parents’ roles in helmet use, and the impacts of road crashes. Additionally, mothers were given the opportunity to express their ideas and concerns related to their own road safety and of their children’s. Real life examples were raised and discussed to expose the seriousness of road crashes and the importance of helmet use. Students gain pedestrian skills on a traffic simulation corner. 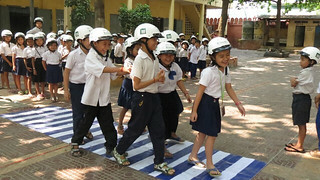 On March 13, extracurricular road safety activities sponsored by Manulife were organized for 150 students at Wat Preah Put Primary School in Phnom Penh. Students were trained on the fundamentals of road safety, including how to follow traffic laws and wear their new helmets correctly. Activities included Q&A, drawing contests, pedestrian and bicyclist safety lessons, and interactive road safety games. These activities aim to create enthusiasm among students about the importance of helmets and exercising safe road behaviors every day. A mother A student teaches her fellow peers road safety skills. AIP Foundation’s peer-to-peer program sponsored by Chevron is designed to reinforce road safety education school wide and maintain sustainability of the Helmets for Youth campaign messages. The program aims to encourage students to share road safety information with their peers, friends and family and in parallel allows students to familiarize themselves with the important road safety skills and risks they will be imparting. During the program, student representatives were informed about road safety and the general situation of road crashes in Cambodia, including the high number of fatality and injury rates reported in 2012 and the reason behind the high death toll caused by road crashes. Students gained road safety skills around the prevention of road crashes, injuries, and fatalities, focusing on the importance of helmet use and wearing helmets correctly. Moreover, peer educators informed students about the approved action plan for the Road Safety Policy by the government, activities leading up to National Road Safety Week in April and the high risk of road crashes during the upcoming Khmer New Year, typically a time of travel for Cambodians.